Chennai: Rio Olympic champion Carolina Marin defeated Indian ace Saina Nehwal as Hyderabad Hunters thrashed Awadhe Warriors 6-(-1) in a Premier Badminton League (PBL) match at the Nehru Indoor Stadium. The Spanish left-hander proved too good for Nehwal as she won 15-5, 15-7 in a jiffy to add to the Warriors' woes. Hyderabad Hunters' Carolina Marin celebrates her victory over Saina Nehwal. Hyderabad Hunters later won the mixed doubles encounter to register a clean sweep. Satwiksairaj Rankireddy and Pia Zebediah outplayed Hendra Setiawan and Christinna Pedersen 15 -9, 15-9 to finish the demolition job in style. 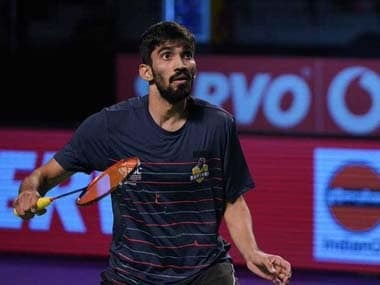 Earlier, World No 16 Sai Praneeth posted a stunning 15- 10, 15-10 victory over compatriot and World No 3 Kidambi Srikanth in the Warriors' trump match to put the Hyderabad team on the road to a thumping win. Praneeth who had beaten Srikanth last year in the Singapore Open to win his first Superseries title was completely dominant in the match and after the initial burst of points from the Denmark Open winner, it was Praneeth who controlled the opening game with his precision. He went into the break with a slender 7-8 deficit but after the interval, Praneeth displayed great precision to win the opening game. Praneeth was on a roll in the second game as he raced to an 8-0 lead. Though Srikanth did very well to reduce the gap and take points, the Hyderabadi sealed the match. Earlier, World No 18 Lee Hyun Il of Korea registered a thrilling 13-15, 15-9, 15-14 win against Parupalli Kashyap to guide Hyderabad Hunters to an early 2-0 lead against Awadhe Warriors. Kashyap who has been in stellar form this season started on a high note with his power smashes proving no match for the 37-year-old Korean. Even though the Lee gave him a tough fight it was the Indian who bagged the opening game. In the second game, Lee got his act together and was quick off the blocks to head into the interval with an 8-3 lead. After the breather, Kashyap won three points on the trot to reduce the lead and was not in the mood to go down so easily. However, Lee maintained his hold on the game and won it to force a decider. Lee, the oldest player to win a match in the PBL came out a different player altogether and got on to the front-foot from the word go. He raced to an 8-3 lead and his combination of smashes, drop and deceptive cross court hits were too much the Indian to handle. 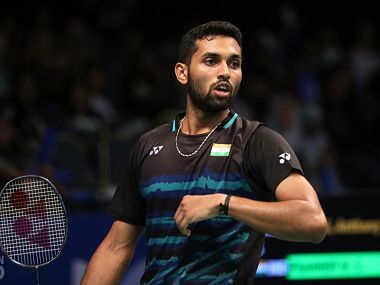 Though Kashyap tried to stay on in the hunt after the change of ends and saved six match points, Lee did not give him any chance of a comeback and cruised to win the match and give his side the advantage. Hyderabad won the first point of the day after their men's doubles pair of Markis Kido/Yoo Yeon Seong came back from a game down to win 14-15, 15-6, 15-11 against the combination of Or Ching Chung/Tang Chun Man.